Distance: 339 miles (545.5 km) – I had to miss a little over 150 km due to the Matane Wildlife Reserve closure. See below for details. Back to School: Less than an hour after disembarking the train from Montreal, I was invited to give an impromptu lecture on hiking and wilderness skills at the local college in Gaspe. What was going to be a quick 15-20 minute talk, morphed into a very enjoyable one hour plus Q&A. The students were all very attentive, inquisitive and thankfully bilingual, as my French is beyond woeful. A huge thanks to Phillippe (the teacher), Korinne and Aline for all of their help and hospitality during my brief time in Gaspe. 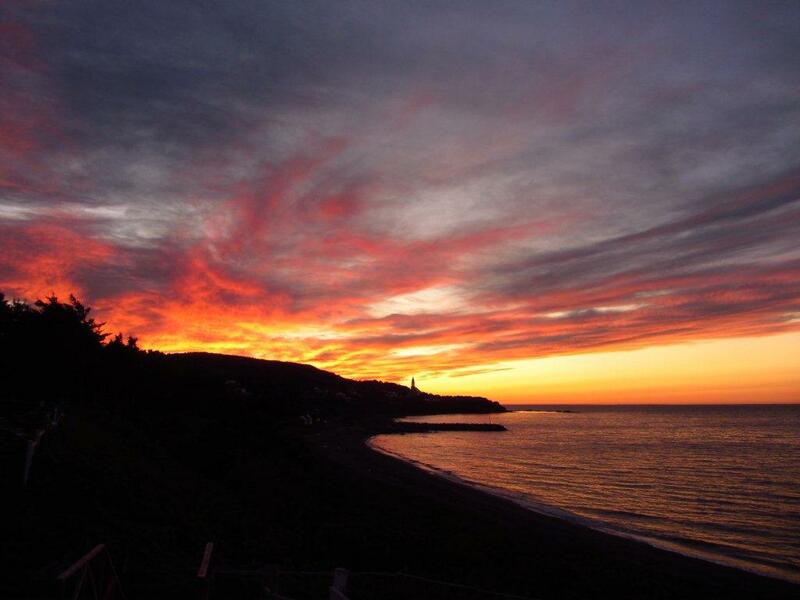 Gaspe Coast: Gorgeous sunsets, stunning fall colours and atmospheric small towns along the coast. Even the road sections weren’t that bad – short, nice views and not too many cars. Favourite stop was the Auberge La Maison Lebreux in Petit Valle. One of the most beautiful settings for a Bed & Breakfast I can ever recall. Ste.Margerite to Matapedia: I was fortunate to spot six moose during this scenic and occasionally challenging stretch. The hike through Clark canyon and the sunset from Refuge Le Corbeau were particularly memorable. A big thanks to Jesse, Genevieve and Remi for their hospitality and also their efforts in maintaining this impressive section of the IAT. The Closure: This is an easy one. Having to skip the Matane Wildlife Reserve and the adjoining western section of Gaspesie National Park. In 2011, the entire Matane Reserve was closed in early September for the exclusive use of hunters. From what I was told, the authorities didn’t even inform the IAT committee until a week before the decision was put into effect. Personally, I had no idea until I reached Gaspesie National Park. I was still working under the assumption that the information I had received from the IAT (Quebec office) a couple of months previous was still valid. It seems as if the combination of new management and cashed-up hunters, means that for the time being late-season hikers need to detour around what is reputedly one of the most beautiful sections of the entire IAT. A real shame, as it strikes me that September/October with its kaliedoscope of autumnal colours, is the premier time of year for hiking in this region. Recovery: I ended up taking an extra week’s break between the end of the Sierra High Route (SHR) and the beginning of the IAT in order for the ligaments in my left ankle to heal. My time was spent writing, planning and eating sumo-like meals at hobbit-like intervals. By the time I started out from Cap Gaspe, I weighed 9 lbs (4.1 kg) more than when I finished the SHR.